Description: NS SD70 2504 (ex-CR 2504) heads westbound on the Harrisburg line in Cove, PA. Description: An unknown symboled 2-car local heads west through Linfield. This might look like an engine move to you. Description: NS steel slab train 69J cruises west at Belmont behind former Conrail SD70. Description: Train 69J rumbles west with a standard cab on point. Description: Taken from an overpass near the highway. 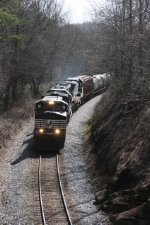 Description: NS 2504 was the second unit on this westbound COFC train. Description: Southbound with double stack train at mp 261, train is Sandusky Ohio, to Harrisburg Pa. Description: Southbound with double stack train passing oiler, train is Sandusky Ohio, to Harrisburg Pa. 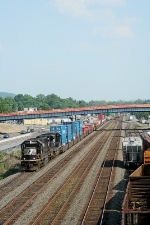 Description: Southbound passing Susquehanna River on siding with a long double stack train.